We are going to pile up another $3 trillion in national debt in just the first two years of the Obama administration. If the annual deficit should sink below $1.5 trillion, it will be called fiscal sobriety. Why, when we owe $12 trillion, would the Obama administration set out budgets that will ensure our collective debt climbs to $20 trillion? Why are we borrowing more money, when Medicare, Social Security, the Postal Service, Amtrak, etc. are all insolvent as it is? What is the logic behind something so clearly unhinged? I present seven alternative reasons — some overlapping — why the present government is hell-bent on doubling the national debt in eight years. Either one, or all, or some, or none, of the below explain Obama’s peculiar frenzied spending. 1) Absolutely moral and necessary? The country is in need of massive more entitlements for our destitute and near to poor. Government is not big, but indeed too small to meet its moral obligations. Deficits are merely record-keeping. Throwing trillions into the economy will also help us all recover, by getting us moving again and inflating the currency. And we can pay the interest easily over the next 50 years. Just think another World War II era — all the time. So big spending and borrowing are genuine efforts of true believers to make us safe, secure, and happy. 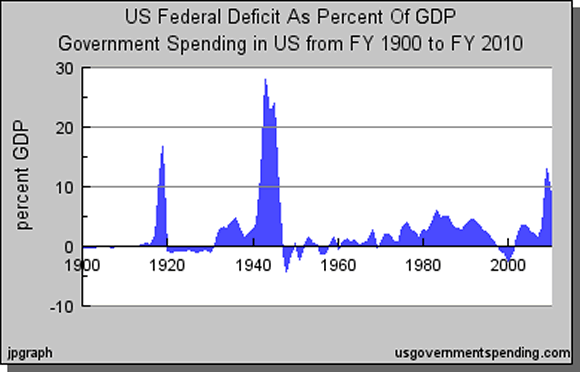 The spending per se is not so important, as the idea of deficits in general will ensure higher taxes. Nationalized health care, cap and trade, new initiatives in education, more stimulus — all that and more is less important than the fact that huge defects will require huge new taxes, primarily from the upper-classes. I see no reason why the total bite from state income, federal income, payroll, and health care taxes cannot soon in theory climb to 70% of some incomes (e.g., 10% state, 15.3% FICA, 40% federal, 3-5% health care). In other words, “redistributive change” is the primary goal. This aim is premised on the notion that income is a construct, if not unfairly calibrated, then at least capriciously determined — requiring the more intelligent in the technocracy to even out things and ensure an equality of result. After all, why should the leisured hedge-funder make all that more after taxes than the more noble waitress? So big spending and borrowing mean big deficits, and that means taxing the greedy and giving their ill-gotten gains to the needy. Or does rampant borrowing for government spending reflect our despair over the inability of millions to know what is best for themselves? For democracy to work, all of us must fully participate. But because of endemic racism, sexism, class bias, and historical prejudices, millions of Americans do not have access to adequate education and enlightenment. Therefore, a particular technocratic class, with requisite skill and singular humanity, has taken it upon themselves to ensure everyone gets a fair shake — if only government at last has the adequate resources to fix things. If it proves problematic for one to register and vote, then there will be a program to make 100% participation possible. If some of us are too heavy and too chair-bound, we can be taught what and how to eat. If some of us do not study, we can adjust academic standards accordingly. In one does something unwise, like buying a plasma TV rather than a catastrophic health care plan, then we still can ensure he is covered. In other words, an all-knowing, all-powerful, all-moral guardian class requires resources to finish the promise of participatory America. After all, why would we allow the concrete contractor to “keep” 70% of his income only to blow it on worthless things like jet skis or a Hummer in his garage or a fountain in his yard — when a far wiser, more ethical someone like Van Jones could far more logically put that now wasted capital to use for the betterment of the far more needy? Go here to read the rest. In times of national crisis, when the life of a nation is at stake, World War II is a prime example, you spend whatever it takes to get out of the crisis. As a percentage of our gdp we are currently amassing debt at a rate which, in the past 100 years, has only been exceeded during World War I and World War II. Getting us to this situation has been as a result of bi-partisan folly. However, the current administration has taken this fiscal lunacy to an entirely new level. We have a debt crisis looming of the first magnitude, and the administration seems to have no clue as to what to do except to amass even more debt. A few of my posts on the debt crisis we find ourselves in. The rationale for the “stimulus” is rooted in Keynesian economics. The problem with this one as opposed to previous ones is rather than using the stimulus to kick start a stalled economy, combined with Obama’s other policies such as Gov’t takeover of major parts of the economy such as Fannie & Freddie, AIG, GM etc, health care reform, Cap & Trade etc. together they are going to have the opposite effect. The Federal Gov’t now owns 80% of the mortgages in the US. So it is a double whammy. There is, and will be will be no “recovery”. The current “recovery” is a dead cat bounce. Bernanke and Geithner’s pronouncements that the “recession” is over is the equivalent of Neville Chamberlain’s “Peace for our time” speech right before Germany invaded Poland. We are in the eye of a hurricane right now and the second half is going to be worse than the first because the Fed is out of bullets. The next shoe will be the collapse of the dollar (brought about on purpose) and the introduction of a regional (Amero) or international currency (SDR’s). Anything denominated in dollars will be bought out out for pennies on the dollar. Obama is just a tool of the gang that surrounds him to tank the economy on purpose to bring about the NWO. Obama isn’t smart enough to think this stuff up on his own, but then the same could be said for Bush who lost it with me after telling America to “go shopping” after 9-11. In reality, this has all slowly been taking place since the end of WW 1. We’re just lucky enough to be there for the climax. Given that 53 cents of every dollar of income taxes goes to support current and past military misadventures, I think that VDH needs to reexamine the real cause of America’s fiscal insolvency. It’s also worth pointing out that Obama, whatever else he is doing, is set to lower the deficit from Bush’s time in office. Why not go one better and use Maryland sales tax revenue as your denominator? I was not aware that any portion of my New York State income tax payments were devoted to ‘past and present military adventures’. (Though I rather do like the idea of Gov. Patterson calling out the National Guard to arrest the state legislature and stuff them in the Albany County Jail, now that you mention it). About 5% of Gross Domestic Product is devoted to military expenditure. (A decade ago, the proportion was about 3.5%). Prior to the recent federal spending binge, about 14% of all public expenditure was devoted to the military. If you wish to apportion debt service costs among other other sorts of expenditure, perhaps 16% of public expenditure was so devoted. That would be, ahem, the sum of costs for maintaining the military, not the costs attributable to ‘past and present military adventures’. (Unless it be your contention that military expenditure itself is illegitimate). We must live in the United States of Topsy Turvy Land. The projected deficit for 2010 (Obama’s second year in office) which was three times as large as Bush’s last deficit *may* turn out to be only 2.5 times as Bush’s last deficit and somehow we’re to consider Obama to have fixed Bush’s mismanagement? Nevermind that Obama’s own budget initiatives project ever increasing deficits YoY. So wj’s citation was an assertion made by the Obama administration that still leaves the deficit higher than it was when Bush was in office. Next time you might want to read the sources before linking to them. As I understand it, Obama inherited the 1.3 trillion dollar deficit from the Bush administration, and so it is misleading to attribute the ballooning deficit to his policies alone, which is all I intended to say. If you look at the CBO forecast (and I acknowledge that many deny the accuracy of the CBO), Obama’s budget *will* lower deficit’s longterm. Of course, I am not a supporter of Obama, and it is not terribly important to me whether is is moderately more or less fiscally insane than Bush; but it is fair to point out that the current deficit problem is not *entirely* due to his own recklessness. That figure includes the Pentagon budget request of $717 billion, plus an estimated $200 billion in supplemental funding (called “overseas contingency funding” in euphemistic White House-speak), to fund the wars in Afghanistan and Iraq, some $40 billion or more in “black box” intelligence agency funding, $94 billion in non-DOD military spending (that would include stuff like military activies funded through NASA, military spending by the State Department, etc., miilitary-related activities within the Dept. of Homeland Security, etc. ), $123 billion in veterans benefits and health care spending, and $400 billion in interest on debt raised to pay for prior wars and the standing military during peacetime (whatever that is!). What is wrong is that this fellow pads the payroll in various ways by adding the budgets of the intelligence services, the space program, veterans hospitals, and the federal police; and pads it further by attributing the entire charge for service on the federal debt to military expenditure, as if there were no domestic expenditure whatsoever. He then further manipulates his figures by expressing these charges as a ratio of federal income tax revenue, even though north of 40% of public expenditure is by state and local governments and most federal expenditure is financed out of Social Security taxes and bond sales. But you knew that. Thank you gentlemen. This thread, thus far, is a classic example of what robust combox debate should be! One thing I like very much about VDH is that he is not only a professor, but a farmer. He and his brother run a California raisin farm that has been in the family for 4 generations. So his great store of academic learning is balanced by the fact that he is familiar with the ordinary, down-to-earth concerns of farming folk. The difference between military spending and spending on social programs is that I see defense spending as a legitimate function of the federal government. Obamacare is another matter entirely. I certainly think provision should be made for those unable to obtain healthcare for themselves. I don’t believe the federal government should be in the business of providing it for all of us, whether we want it or not.